I was invited for a talk to Ghazali Premier College (GPC) and I was very surprised when I visited the place. Without any doubt, it was one of the best institutions I had seen in years. GPC immediately became an inspiration for me. Muhammad Tariq, the director of GPC left a lucrative job in Dubai and came back to Pakistan to play a positive role. It was always on the back of his mind to contribute towards the society. Ghazali education trust took him on board and they went on to acquire this new boarding school which was going to house talented students from all across the country. Students from 354 schools of Ghazali education trust were selected and Ghazali Premier college came into being. One year onward, its something worth visiting. The facility is located in suburbs of Lahore on Multan road. It is a purpose built campus with attached mosque and hostel in one campus, housing 118 students. 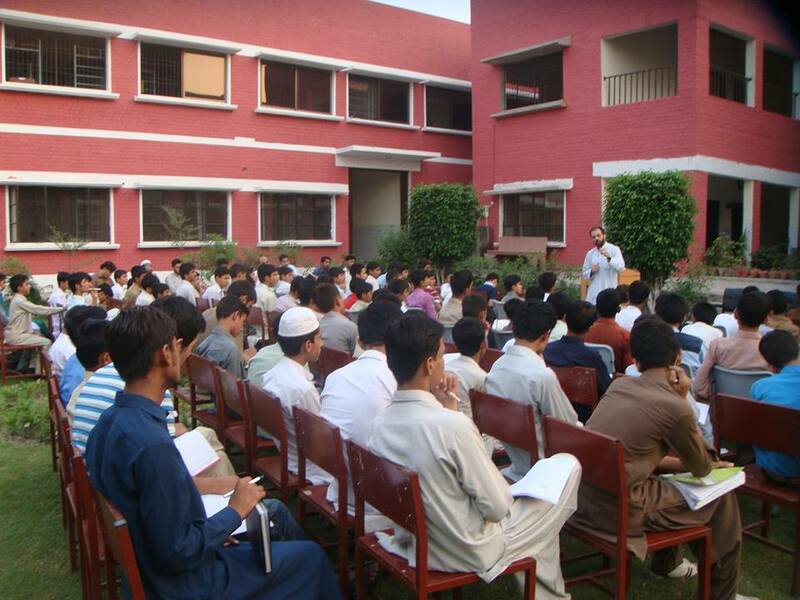 These students are selected from all over Pakistan. I was delighted to know that six students from Balochistan are also in this campus. Many of the enrolled kids belong to poor families and quality education is a distant dream for them. GPC provides free education, boarding and lodging to all the students. It is difficult to think about a free boarding school which intakes underprivileged students from all over the country and gives them free education and boarding without any compromise on the quality of education. GPC is certainly a shinning star on the dark horizon of Pakistan. The focus in GPC is on inculcation of Islamic ethical values along with contemporary education. The schedule of students start with Fajar prayers at the mosque and then they are taught lessons from holy Quran. Entire day activities are thoroughly planned which includes studies and co-curricular activities. Weekends are reserved for social activities and guest lectures. Typically I got impressed with the social activities of students when I was told that currently these students have planted 4000 trees in the nearby locations of the campus. I was told that students are very keen in social activities which is actually a missing aspect in typical Pakistani education system. My lecture was on contribution of Muslims towards science and how can we get back on track. I tried to involve the kids and was stunned to see their IQ level. The knowledge level of 7th and 8th graders was amazing. Their knowledge was also certainly above the text books. They were very energetic and confident. I was amazed by the quality of their questions. Given the scenario that these kids belong to remote areas of the country, their participation in my talk reflected the hard work of their teachers. During the interaction with the teacher, I came to know that most of them are highly qualified, with some having their Masters from abroad and all of them joined hands to contribute towards the betterment of the society. Ghazali Premier Trust is planning to open many colleges in far flung areas of Pakistan to spread education in remote areas. The beauty of this project is that it is entirely free and the students have to pay nothing. The quality of education is comparable to any best system just because of the dedication of the team. Resources are key to such projects. The team of GPC is trying its level best to raise donations so far. They are also thinking about expanding this project and plan to open other such boarding schools in remote areas of the country. I hope that people like these will continue their efforts. It is our job to help them in every sense so that they succeed in their mission of making Pakistan a better society. I think this is a great initiative in times where quality education has gone beyond the reach of most of Pakistanis. It is now a profitable business providing quality education and this creates inequality in the society and all other sorts of troubles. Things like GPC by GET are the need of the hour. At this point, I would like to suggest that getting contributions/donations will continue till the world ends and you will have generous people funding the projects like these but we need to think of a regular revenue source in order not to face any difficulty at any point in future. I have seen people making others emotional by their speeches and they go as far as crying in front of the audience to make them fund the organization. These projects must go forward with least possible hurdles, the funding/donation should be a surplus if the business i.e. the regular revenue source, goes in to loss somehow. Finally, I pray to Allah that more and more people with the right kind of intentions join hands to establish and grow these projects for the ultimate cause of the betterment of the society and pleasure of the Almighty. Nation who is divided into many things which are not good for society.